Fresh, small batch, refrigerated soups and spreads made with all plant-based ingredients that are vegan and free from gluten, refined sugars and preservatives. Packaged in reusable high-quality mason jars, Jen's Jars products contain no junk, nothing you can't pronounce. "So excited to use this as part of my meal planning!!" "So awesome to have real, super healthy food, available on the go - especially during busy weeks." "Jen's Jars soups are delicious! They make for a simple, healthy and filling dinner or easy lunch. The flavors are unique and fresh!" "We thoroughly enjoyed the products we ordered from Jen's Jars! The packaging was very attractive and easy to dispense and keep fresh." "Thanks Jen’s Jars for your dedication to helping make eating healthy so convenient!" "It is the perfect thing to have on hand for weekends and for bringing to work for lunch. The Pesto is one of the best I’ve tasted and it’s sure to be a staple in our household!" "Love the convenience of having a healthy choice. The quality is amazing. Can’t wait to put more in the freezer." "Every detail of Jen's Jars is perfect. It's not that the label peels off nicely, it's that every detail - the flavor, the ingredients, the packaging - is given that much attention." "I love the quality of the ingredients used and the flavor of the products! It's so nice to have a healthy meal with the soups that you can pour, heat and serve. I love Jen's Jars and my kids do too!" Find out why I started Jen's Jars and why I'm so passionate about a healthy lifestyle! 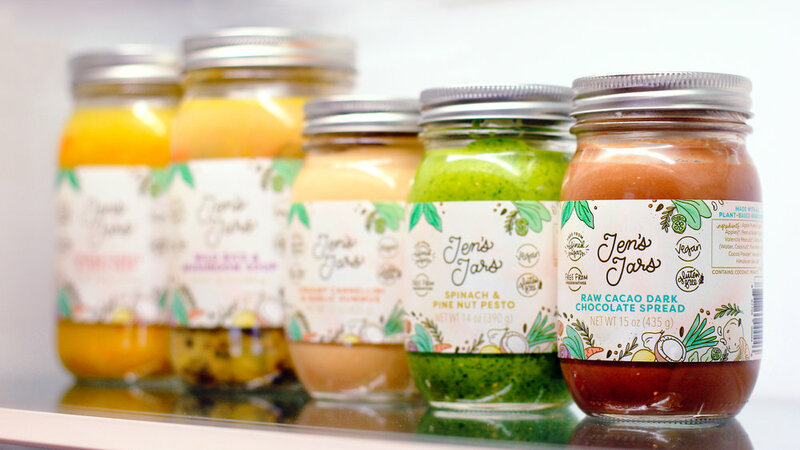 Check out all of Jen's Jars products and learn about all the goodness inside! Find out more about the shelf life of Jen's Jars products and how to keep your product fresh. Find out about Jen's Jars Recycle Program and some fun and creative ways to reuse your jars! Take a look at some of my favorite recipes, both home made and from my favorite food bloggers. Check out interesting articles and tips for living a healthy lifestyle!